I received my order yesterday. I love the pleated. The V-neck is sheer. The style is excellent. I will introduce your website to all my friends. You are a amazing shopping website. Love you. Thank you a million. Great tailoring. Perfect color. This is my first purchase with you. I am happy with my dress. The design is special. I like the pleated and V-neck. I will definitely buy more things here. I love the mermaid wedding dress so much. 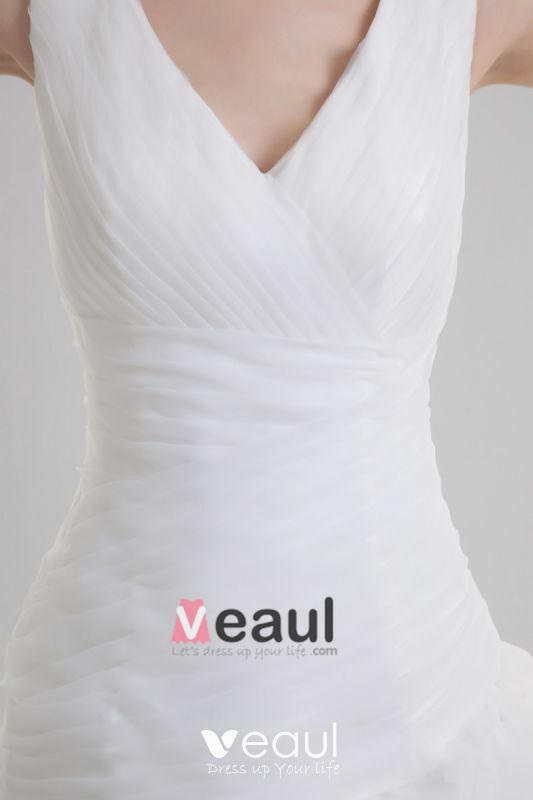 The pleated is so delicate and the whole dress is of very high quality. In a word, the wedding dress is worth the money. We have received the dress. It arrived yesterday. Marvellous! The lace fabric is both of high quality and delicate. We are more than satisfied. Thank you very much. We will order more items in the future. Thank you again for your nice service. It is a stunning dress. It came timely with the bridesmaid dresses. The dress fits me quite well. I love the pleated on the bottom of this dress. I will definitely purchase more from Veaul! Thank you Veaul. It is really a gorgeous dress! I love its elegant design very much. It's a great idea to shop on your website. You guys are so nice. I'm completely satisfied. Your website is amazing! I can buy anything I need for my wedding! The wedding dress arrived earlier today is fabulous! The fabrics used are very good and the dress fits me perfectly. This is my first time I've ordered something from your website. I was suggested to have this dress customized. I was a little afraid of ordering clothes online at first. I was worried that the size would not be suitable. But when I put it on, I was totally amazed. The stunning dress fit me perfectly. Wow, what an amazing wedding dress!